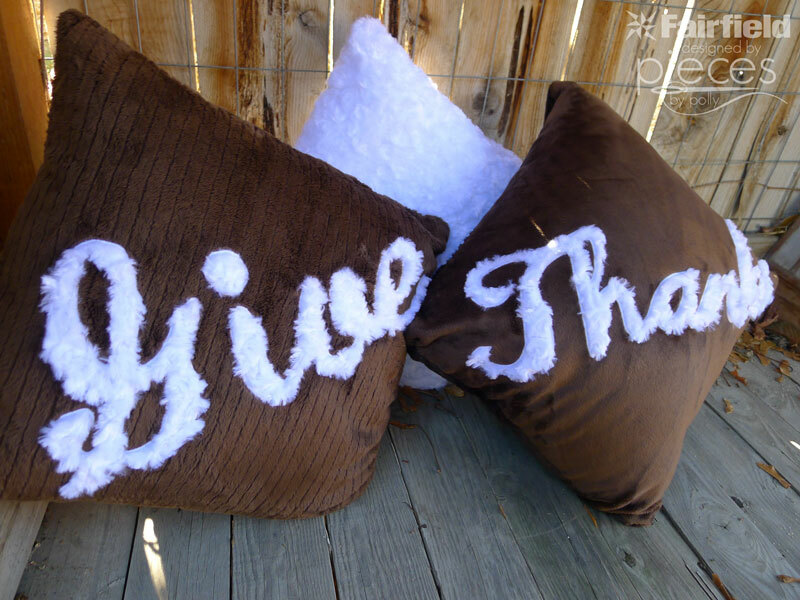 I'm so excited to share these "Give Thanks" Thanksgiving Pillows today. I know for me Thanksgiving is often the holiday that I don't sew for. Once Halloween comes, I throw myself fully into gear getting gifts ready for Christmas, so this year I wanted to do at least one project to add to my Thanksgiving decor. Thanks to Fairfield World for providing me with the Pillow Inserts and fusible fleece and compensating me for writing this post. All ideas and opinions are 100% my own. Also thank you to Shannon Fabrics for providing the cuddle for previous projects and leaving me with enough fabric scraps to make these. 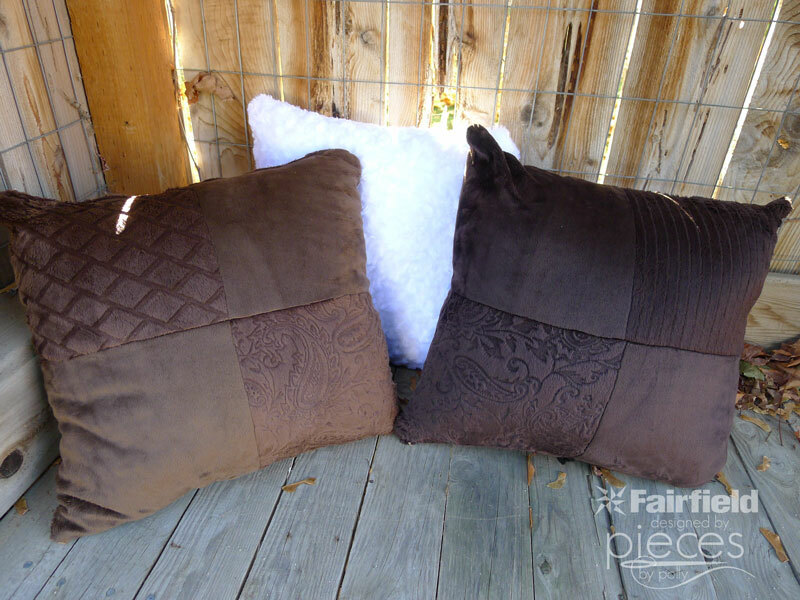 These could easily be done with regular quilting fabric, but my kids have been begging for more cuddle pillows. I love the pop and extra dimension that the Rose Cuddle gives the words. And the best part is that you could easily make them in an afternoon. Skill Level: Intermediate if you're using Cuddle Fabric. Beginner with some experience if you're using regular fabric. Time: Make it in an afternoon. Walking foot if recommended if your machine doesn't have an even feed feature. I have about half a Hot Chocolate Cuddle Cake plus some yardage scraps of brown cuddle left over from some earlier projects, so that's why one side is patchwork and the other side is one piece of fabric. Purchasing Hot Chocolate Cuddle Cake will give you enough squares for both sides of two pillows and still have a couple squares left over. We started with 1/2 yard of the rose cuddle and made a 16" accent pillow, which matches these and we also plan to use with our Christmas and Valentine's decor too. If you've never sewed with cuddle fabrics before, check out the Cuddle Applique Tips, and Cuddle Sewing Tips from Shannon Fabrics. Start by laying out four-patches of your cuddle cakes squares. The squares in the pack come in two color tones with a variety of textures. You can mix and match, but I decided to go for one lighter pillow and one darker pillow. Sew your blocks together. I'm not a bit pinner, but when you're working with cuddle YOU NEED TO PIN frequently to get the best result. Sew with 1/2 seams. For more tips on sewing with cuddle, you can go here Cuddle Sewing Tips. I prefer a tight fitting pillow and planned to use 20" pillows, so I trimmed my finished 4-patches down to blocks down to 19" to give a finished 18" pillow cover. If you prefer a slightly looser pillow, then there is no need for trimming. Print your Give Thanks words template. Tape the pieces together so that the words are complete. 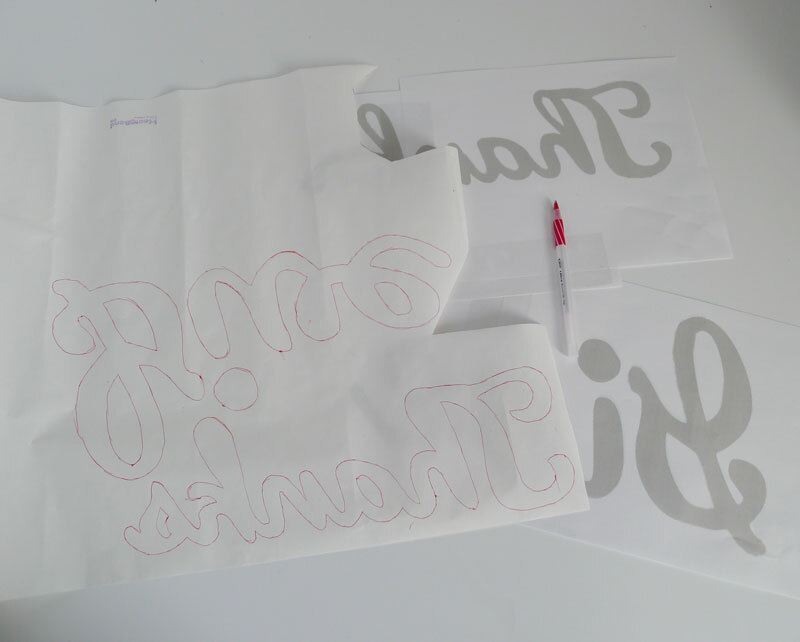 Trace onto the papery side of paper-backed fusible web. Iron onto the BACK of your Rose Cuddle with your iron set to the polyester setting. Iron just long enough for the for the fusible web to stick. You DO NOT want to over-iron cuddle fabrics. Peel off the paper backing. 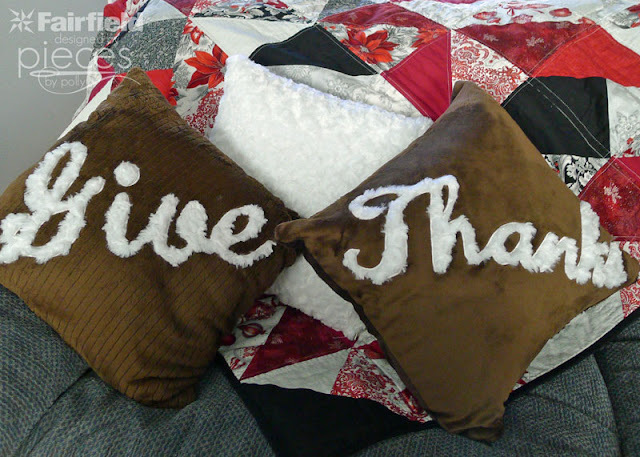 Arrange the words onto your pillow front, centered and diagonal. Test your iron's heat before starting. Iron just enough for your words to begin to stick. Then flip your block over and iron more throughly from the back. Make sure your iron is NOT too hot. You way want to use a protective ironing sheet to protect the cuddle. Cut a piece of Smooth Fusible Fleece Interfacing slightly larger than your words. Iron onto the back of your block behind the words. This will keep your work from puckering as you stitch the applique. 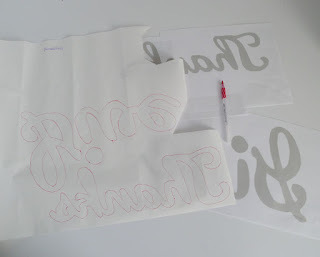 With white thread in your machine, set your machine to a tight zigzag or satin stitch about generous 1/8 wide. Stitch around the edges of your words. As much as you can, pull the cuddle fuzz out of the way of your stitching to give the stitching the cleanest edges possible. Pull the threads to the back and knot. Add your zipper to the lower edges of your pillow if you are making a pillow cover. If you need instructions for adding the zipper, you can see these instructions for a simple zippered pillow. Leaving your zipper partly open, pin well and sew around the four edges of your pillow with a 1/2 inch seam allowance. 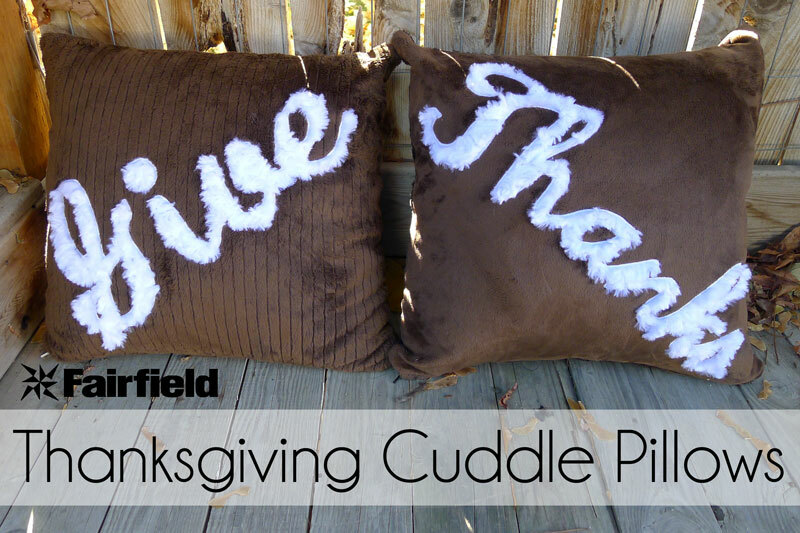 Turn right side out and insert your pillow forms or Poly-Fil® Premium Fiber Fill. Free pattern for making the Simple Christmas Fat-Quarter Quilt in the background can be found here.